Yes we do. We offer home delivery and set-up within 30 miles of any Rife's location for just $59 and between 30-50 miles for just $69. For deliveries over 50 miles we charge a $69 base fee plus an additional $1.50/mile (one direction) for each mile beyond a 50 mile radius. We only deliver within the state of Oregon. Is the cost of delivery to my home already included in the price? No it's not. We do not build the cost of delivery into our prices so you will always have the option of picking the furniture up with your own vehicle and you can save what you would've spent on our delivery fee. Does Rife's deliver mattress sets at no extra charge? In most cases, yes! Rife's offers free local delivery (within 30 miles of any Rife's location) of your qualifying mattress purchase of $599 or more, and will also haul away your old mattress set at no additional charge. Can I pick up my furniture rather than have it delivered? Absolutely. Depending on the specific circumstances, most items can be made available for pick-up at our distribution center in Eugene or at any of our retail locations throughout Oregon. Rife's Distribution Center is located at 4248 W. 6th Ave, Eugene, OR 97402. For the greatest level of service, please call in advance with 24 hours notice when possible -- 541-868-1005. Please bring adequate tie-downs, padding, and protective covering during inclement weather. Rife's personnel can assist with loading but customers are responsible for sercuring and protecting their own load. Rife's cannot be held responsible for any damages incurred to merchandise once it has left our premises. Can I get my furniture delivered if I live outside of Oregon? Generally speaking the answer is no. However, we are happy to explore possible options with you. Contact us and let's see if we can work something out. Will Rife's haul away my old furniture? Yes. If you need your old furniture to be hauled away we would recommend calling one of many non profits in your area that will likely haul the items away at little to no charge. However, Rife's can haul away your old furniture for $20 per piece. Number of pieces we'll haul away is limited to the number of pieces you're having us deliver. For instance, if we are delivering a sofa and loveseat, we will haul-away your old sofa and loveseat for $20 each. Free haul-away of one mattress set is included at no additional charge with each new mattress set purchase delivered by Rife's. Not at this time in most cases. The only exceptions to this currently are Tempur-pedic pillows and most items from Malouf (pillows, sheet sets, douvet covers, etc...). Contact us to learn more about our drop-ship program. Please refer to our delivery policies above for more details. All exchanges and returns must be authorized by Rife's and are subject to specific policies concerning the same. Special orders and items sold “As-Is” cannot be returned. All other items (with the exception of Special Orders, items sold As-Is, and mattress sets) may be returned for refund or in-store credit within 72 hours of receipt of goods. Items must be returned in the same condition in which they were received. Additional delivery fees will apply to all pick-ups and exchanges made at the customer's request. Customer is responsible for shipping fees on returns of drop-ship items. If your purchase was made by cash or check, your refund will be mailed to you in the form of a check. Please allow up to 14 days for processing. No cash refunds. What is the warranty on my new furniture? Specific warranties will vary depending on the manufacturer of the furniture and the specific terms and conditions under which the item is being sold. Learn more here! Does Rife's Home Furniture offer any stain protection or extended warranty plans? Yes we do. Rife's is proud to offer Montage Furniture Service's Advantage Plan. Contact us and we'd be happy to go over the details of the Montage Advantage Plan. Who do I contact if I'm having issues or concerns with my new furniture from Rife's? We have a dedicated Customer Service Department that's here to help. You can email us at rhfcustomerservice@gmail.com, call us at 541-868-1008, or fill out a customer inquiry right here on our website at http://www.rifeshomefurnitureonline.com/p/service-and-warranty. We'd love to help! Who should I contact if I'm having issues with my adjustable bed base? The makers of adjustable bed bases have their own customer service departments dedicated to helping with these issues. In most cases the phone numbers for these customer service lines can be found on the back of the remote for the base and/or in the owner's manual. Contact us if you have difficulty finding the appropriate phone number and we'll help you with that. Does Rife's offer a comfort trial period for mattresses? Yes we do. Rife's offers a Sleep Comfort Guarantee on Sealy Posturepedic Hybrid, Stearns and Foster, and Tempur-pedic mattresses. The normal adjustment period for a new mattress is about 30 days; therefore, customers must keep their new mattress set for a minimum of 30 days from the date of delivery. Within 31-90 days from the date of delivery, if not completely satisfied, customer may request a one (1) time re-selection for another mattress of equal or greater value. No refunds will be given. In order for the mattress to be exchanged, it must be free from stains; therefore, the customer must purchase a new mattress protector from Rife's Home Furniture prior to delivery of the new mattress in order to be approved for re-selection. The exchange must be done by delivery personnel authorized by Rife's, and customer must pay the appropriate delivery fee to cover the cost of the service. Sleep comfort guarantee does not apply to foundations or adjustable bases. Can I make my purchase online? Our site has a shopping cart for your convenience. Simply make your buying selections, fill in your name and delivery information, and we will complete your transaction with you by phone. This final interaction gives us the chance to verify all information and answer any remaining questions. Our customer service agents will process your payment, confirm your order details, and provide you with your order number for delivery tracking purposes. Can I make my purchase by telephone? Absolutely. We are happy to take your credit card payment by phone. If you wish to pay with cash, check, or financing, we will need you to come down to any of our 7 locations to transact in person. 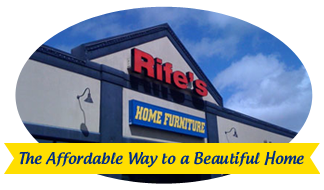 Does Rife's Home Furniture offer payment plans? Yes we do. We currently have many financing options available with approved credit from a variety of lenders. We also offer no-credit needed, lease-to-own options with Acceptance Now. You can apply at any of our 7 locations or you can click here to learn more and apply online. Please contact us for general info or questions regarding these options. Are all of your available products shown online? No. We can definitely get more than what we're showing on-line. In some cases we are simply waiting for the manufacturer to send us the info we need in order to post an item to our site. Let us know if you have something in mind and we'll look into for you. Are all products shown on your site on display in your stores and in-stock? No. Our website contains thousands of items that we do not display in our stores or stock in our distribution center. We are happy to order such items for you but a few rules do apply: A 50% non-refundable deposit is required on all special orders. Because this product is being ordered especially for you at your request, cancellations will not be accepted and there will be no refunds. Balances shall be paid in full within 14 days from the time your complete order is received at our distribution center. Failure to pay-off within 14 days may result in forfeiture of deposit and relinquishment of product. Order must be paid in full prior to time of delivery. We do not accept COD payments. Estimated arrival dates of special orders are approximate. We cannot guaranteed the specific arrival date of your order. Rife's gladly accepts debit cards, Visa, MasterCard, Discover, and American Express. We also accept cash, cashier's checks, money orders, and personal checks with proper ID. We also have many finance options to choose from with approved credit (ask us for details). We also offer no-credit needed, lease-to-own options with Acceptance Now. You can apply at any of our 7 locations or you can click here to apply online. Can I sign up for special offers and promotions? Absolutely! You can sign up for special offers and promotions right here on our site by going to our “Sign up for Emails” page at http://www.rifeshomefurnitureonline.com/registration.asp. Who should I contact if I have questions regarding my order after I've made my purchase? Feel free to call your sales associate any time to follow up on the status of your order, to ask any questions about your new furniture, to let us know of any problems or concerns with the new furniture, or just to let us know how happy you are with your purchase and our service. We have a dedicated Customer Service Department that's here to help. You can email us at rhfcustomerservice@gmail.com, call us at 541-868-1008, or fill out a customer inquiry right here on our website at http://www.rifeshomefurnitureonline.com/p/service-and-warranty. We'd love to help!